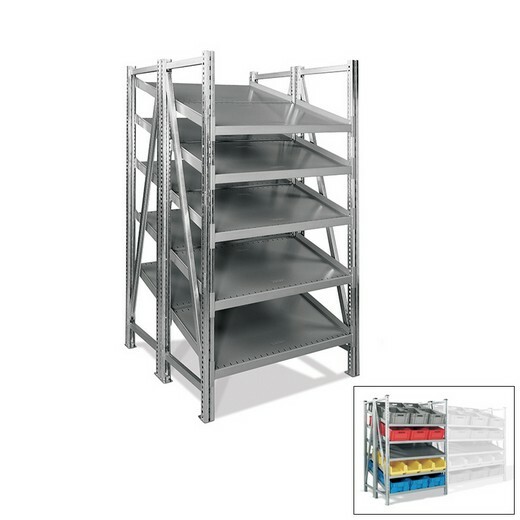 Schaefershelving.com | 60"H x 39"W x 40"D R7000 On-Line Gravity Double Deep Tilted Starter Unit Galvanized. 4 Levels. On-line Shelving from SSI Schaefer is specifically designed to increase efficiency and productivity at assembly line production. Starter units include 2 side frames and 4 shelves. Galvanized frames ensure optimal performance in any condition. Foot plates are included with every order. Double box-style shelves support 550 lbs. Workers can easily see and pick the parts they need, while new parts are supplied from the back, to guarantee continous production. Bottom shelves can be inverted so that empty containers slide out of the way. On-Line offers a cost-efficient stock and storage solution for assembly line operations and is an effective way to utilize the valued space of most assembly line processes. Pre-assembled frames make installation a quick and smooth process. All sizes available in stock, ready to ship for fast and quality service. | Shelving -> On-Line Gravity -> Double Deep Tilted. SSI Schaefer USA. Shop now! Pre-assembled frames make installation a quick and smooth process.